Terpenes (/ˈtɜːrpiːn/) are a large and diverse class of organic compounds, produced by a variety of plants, particularly conifers, and by some insects. They often have a strong odor and may protect the plants that produce them by deterring herbivores and by attracting predators and parasites of herbivores. Although sometimes used interchangeably with “terpenes”, terpenoids (or isoprenoids) are modified terpenes as they contain additional functional groups, usually oxygen-containing. Terpenes are hydrocarbons. 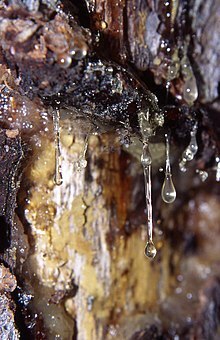 Terpenes are the major components of rosin and of turpentine produced from resin. The name “terpene” is derived from the word “terpentine”, an obsolete form of the word “turpentine“. Terpenes are also major biosynthetic building blocks. Steroids, for example, are derivatives of the triterpene squalene. Terpenes and terpenoids are the primary constituents of the essential oils of many types of plants and flowers. Essential oils are used widely as fragrances in perfumery and traditional medicine, such as aromatherapy. Synthetic variations and derivatives of natural terpenes and terpenoids also greatly expand the variety of aromas used in perfumery and flavors used in food additives. Vitamin A is a terpenoid. The term “terpene” was coined in 1866 by the German chemist August Kekulé. Terpenes are derived biosynthetically from units of isopentenyl pyrophosphate. 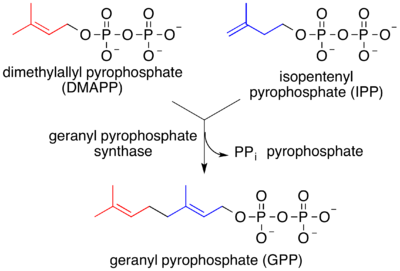 Although the structures of terpenoids are rationalized as derivatives of isoprene (2-methyl-1,3-butadiene), isoprene is not involved in the biosynthesis. The biogenetic isoprene rule or the C5 rule was described in 1953, by Leopold Ružička, who explained that terpinoids can be visualized as the result of linking isoprene units “head to tail” to form chains, which can be arranged to form rings. which also produces cholesterol. One of the intermediates in this pathway is mevalonic acid. The reactions take place in the cytosol. The pathway was discovered in the 1950s. The 2-C-methyl-D-erythritol 4-phosphate/1-deoxy-D-xylulose 5-phosphate pathway (MEP/DOXP pathway), also known as non-mevalonate pathway or mevalonic acid-independent pathway, takes place in the plastids of plants and apicomplexan protozoa, as well as in many bacteria. It was discovered in the late 1980s. The MVA and MEP are mutually exclusive in most organisms. In both MVA and MEP pathways, IPP is isomerized to DMAPP by the enzyme isopentenyl pyrophosphate isomerase. IPP and DMAPP condense to give geranyl pyrophosphate, the precursor to monoterpenes and monoterpenoids. Geranyl pyrophosphate is also converted to farnesyl pyrophosphate and geranylgeranyl pyrophosphate, respectively C15 and C20 precursors to sesquiterpenes and diterpenes (as well as sesequiterpenoids and diterpenoids). Biosynthesis is mediated by terpene synthase. Carvone is a monoterpenoid, a modified monoterpene. Taxadiene, a diterpene, precursor to the diterpenoid taxol, an anticancer agent. Squalene, a triterpene and universal precursor to natural steroids. Monoterpenes consist of two isoprene units and have the molecular formula C10H16. Examples of monoterpenes and monoterpenoids include geraniol, terpineol (present in lilacs), limonene (present in citrus fruits), myrcene (present in hops), linalool (present in lavender) or pinene (present in pine trees). Iridoids derive from monoterpenes. Sesterterpenes, terpenes having 25 carbons and five isoprene units, are rare relative to the other sizes. (The sester- prefix means two and a half.) An example of a sesterterpenoid is geranylfarnesol. Second- or third-instar caterpillars of Papilio glaucus emit terpenes from their osmeterium. Terpenes have desirable properties for use in food, cosmetics, pharmaceutical and biotechnology industries. The genomes of 17 plant species contain genes that encode terpenoid synthase enzymes imparting terpenes with their basic structure, and cytochrome P450s that modify this basic structure. Terpenes are useful active ingredients as part of natural agricultural pesticides. Terpenes are used by termites of the subfamily Nasutitermitinae to ward off predatory insects, through the use of a specialized mechanism called a fontanellar gun. Higher amounts of terpenes are released by trees in warmer weather, and may be a natural form of cloud seeding. The clouds reflect sunlight, allowing the forest temperature to regulate. The aroma and flavor of hops comes, in part, from sesquiterpenes (mainly α-humulene and β-caryophyllene), which affect beer quality. Terpenes are also major constituents of Cannabis sativa plants, which contain at least 120 identified compounds. While terpenes and terpenoids occur widely, their extraction from natural sources is often problematic. Consequently, they are produced by chemical synthesis, usually from petrochemicals. In one route, acetone and acetylene are condensed to give 2-Methylbut-3-yn-2-ol, which is extended with acetoacetic ester to give geranyl alcohol. Others are prepared from those terpenes and terpenoids that are readily isolated in quantity, say from the paper and tall oil industries. For example, α-pinene, which is readily obtainable from natural sources, is converted to citronellal and camphor. Citronellal is also converted to rose oxide and menthol. Summary of an industrial route to geranyl alcohol from simple reagents. ^ a b Eberhard Breitmaier (2006). Terpenes: Flavors, Fragrances, Pharmaca, Pheromones. Wiley-VCH. doi:10.1002/9783527609949. ISBN 9783527609949. ^ Martin, D. M.; Gershenzon, J.; Bohlmann, J. (July 2003). “Induction of Volatile Terpene Biosynthesis and Diurnal Emission by Methyl Jasmonate in Foliage of Norway Spruce”. Plant Physiology. 132 (3): 1586–1599. doi:10.1104/pp.103.021196. PMC 167096. PMID 12857838. Retrieved 1 November 2014. ^ Pichersky, E. (10 February 2006). “Biosynthesis of Plant Volatiles: Nature’s Diversity and Ingenuity”. Science. 311 (5762): 808–811. Bibcode:2006Sci…311..808P. doi:10.1126/science.1118510. PMC 2861909. PMID 16469917. ^ “IUPAC Gold Book – terpenoids”. ^ Kekulé coined the term “terpene” to denote all hydrocarbons having the empirical formula C10H16, of which camphene was one. Previously, many hydrocarbons having the empirical formula C10H16 had been called “camphene”, but many other hydrocarbons of the same composition had had different names. Hence Kekulé coined the term “terpene” in order to reduce the confusion. Dev, Sukh (1989). “Chapter 8. Isoprenoids: 8.1. Terpenoids.”. In Rowe, John W. Natural Products of Woody Plants: Chemicals Extraneous to the Lignocellulosic Cell Wall. Berlin and Heidelberg, Germany: Springer-Verlag. pp. 691–807. ; see p. 691. ^ Ružička, Leopold (1953). “The isoprene rule and the Biogenesis of terpenic compounds”. Cellular and Molecular Life Sciences. 9 (10): 357–367. doi:10.1007/BF02167631. ^ Kumari, I.; Ahmed, M.; Akhter, Y. (2017). “Evolution of catalytic microenvironment governs substrate and product diversity in trichodiene synthase and other terpene fold enzymes”. Biochimie. 144: 9–20. doi:10.1016/j.biochi.2017.10.003. PMID 29017925. ^ Pazouki, L.; Niinemets, Ü. (2016). “Multi-Substrate Terpene Synthases: Their Occurrence and Physiological Significance”. Frontiers in Plant Science. 7: 1019. doi:10.3389/fpls.2016.01019. PMC 4940680. PMID 27462341. ^ Breitmaier, Eberhard (2006). Terpenes: Flavors, Fragrances, Pharmaca, Pheromones. John Wiley & Sons. pp. 1–13. ISBN 978-3527317868. ^ Günata, Z.; Wirth, J. L.; Guo, W.; Baumes, R. L. (2001). Carotenoid-Derived Aroma Compounds; chapter 13: Norisoprenoid Aglycon Composition of Leaves and Grape Berries from Muscat of Alexandria and Shiraz Cultivars. ACS Symposium Series. 802. pp. 255–261. doi:10.1021/bk-2002-0802.ch018. ISBN 978-0-8412-3729-2. ^ Winterhalter, P.; Sefton, M. A.; Williams, P. J. (1990). “Volatile C13-Norisoprenoid Compounds in Riesling Wine Are Generated From Multiple Precursors”. American Journal of Enology and Viticulture. 41 (4): 277–283. ^ Vinholes, J.; Coimbra, M. A.; Rocha, S. M. (2009). “Rapid tool for assessment of C13 norisoprenoids in wines”. Journal of Chromatography A. 1216 (47): 8398–8403. doi:10.1016/j.chroma.2009.09.061. PMID 19828152. ^ Zelena, K.; Hardebusch, B.; Hülsdau, B.; Berger, R. G.; Zorn, H. (2009). “Generation of Norisoprenoid Flavors from Carotenoids by Fungal Peroxidases”. Journal of Agricultural and Food Chemistry. 57 (21): 9951–9955. doi:10.1021/jf901438m. PMID 19817422. ^ Cabaroğlu, T.; Selli, S.; Canbaş, A.; Lepoutre, J.-P.; Günata, Z. (2003). “Wine flavor enhancement through the use of exogenous fungal glycosidases”. Enzyme and Microbial Technology. 33 (5): 581–587. doi:10.1016/S0141-0229(03)00179-0. ^ Thimmappa, R.; Geisler, K.; Louveau, T.; O’Maille, P.; Osbourn, A. (2014). “Triterpene biosynthesis in plants”. Annual Review of Plant Biology. 65: 225–257. doi:10.1146/annurev-arplant-050312-120229. PMID 24498976. ^ Augustin, J. M.; Kuzina, V.; Andersen, S. B.; Bak, S. (2011). “Molecular activities, biosynthesis and evolution of triterpenoid saponins”. Phytochemistry. 72 (6): 435–457. doi:10.1016/j.phytochem.2011.01.015. PMID 21333312. Retrieved 19 January 2015. ^ Boutanaev, A. M.; Moses, T.; Zi, J.; Nelson, D. R.; Mugford, S. T.; Peters, R. J.; Osbourn, A. (2015). “Investigation of terpene diversification across multiple sequenced plant genomes”. Proceedings of the National Academy of Sciences. 112 (1): E81–E88. Bibcode:2015PNAS..112E..81B. doi:10.1073/pnas.1419547112. PMC 4291660. PMID 25502595. ^ Isman, M. B. (2000). “Plant essential oils for pest and disease management”. Crop Protection. 19 (8–10): 603–608. doi:10.1016/S0261-2194(00)00079-X. Retrieved 18 September 2014. ^ Nutting, W. L.; Blum, M. S.; Fales, H. M. (1974). “Behavior of the North American Termite, Tenuirostritermes tenuirostris, with Special Reference to the Soldier Frontal Gland Secretion, Its Chemical Composition, and Use in Defense”. Psyche. 81 (1): 167–177. doi:10.1155/1974/13854. Retrieved 22 July 2011. ^ Adam, David (October 31, 2008). “Scientists discover cloud-thickening chemicals in trees that could offer a new weapon in the fight against global warming”. The Guardian. ^ Steenackers, B.; De Cooman, L.; De Vos, D. (2015). “Chemical transformations of characteristic hop secondary metabolites in relation to beer properties and the brewing process: A review”. Food Chemistry. 172: 742–756. doi:10.1016/j.foodchem.2014.09.139. PMID 25442616. ^ André, C. M.; Hausman, J.-F.; Guerriero, G. (2016). “Cannabis sativa: The Plant of the Thousand and One Molecules”. Frontiers in Plant Science. 7: 19. doi:10.3389/fpls.2016.00019. PMC 4740396. PMID 26870049. ^ Booth, Judith K.; Page, Jonathan E.; Bohlmann, Jörg (29 March 2017). Hamberger, Björn, ed. “Terpene synthases from Cannabis sativa“. PloS one. 12 (3): e0173911. doi:10.1371/journal.pone.0173911. ISSN 1932-6203. PMC 5371325. PMID 28355238.